Let us know if you continue to be uncomfortable for more than a few days. Wearing headgear is necessary for your treatment. Follow the instructions exactly, and you will complete your treatment without any changes in your treatment plan. 5 out of 5 stars based on 12 Appliance reviews. I could not be happier that I chose this office to treat my daughter for her palate expander. The office is very clean and the staff is friendly and gave great care to my child. My son is on the autism spectrum, so any type of dental work has always been extremely challenging! The staff here has shown tremendous patience and understanding throughout my son's experience. Very professional all-around! 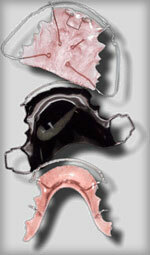 Dr. DeSimone is a master of orthodontics. Her knowledge and practice are second to none and provide for an experience and results that are nothing short of excellence. She’s as intelligent as she is friendly and fun, which makes appointments easy to look forward to. To boot, her staff is wonderful and her office is run efficiently. I highly recommend her. Everyone is Extremely friendly and professional. Never a wait time. Dr. D is the best. Would highly recommend her to everyone for their orthodontic needs. We have been coming to DeSimone Orthodontics for 15+ years and it has been like visiting family each time we come. Our children are grown, but have such fond memories of their experiences and always looked forward to seeing Dr. DeSimone and her staff. Dr. DeSimone and her staff are always friendly and willing to answer all of our questions. We have been very pleased with the results of the recommended treatments for our son. Excellent service and the team took the time to ensure that I had a thorough understanding of the process, outcome, challenges and financing options. The Sweeney family loves DeSimone orthodontics. The staff was always friendly and welcoming. I would recommend to anyone looking for a wonderful office. Both of my children have had work done at DeSimone Orthedontics. We have been very happy here. My daughter has a beautiful smile. I know my son will also have one. We love DeSimone Orthodontics. The system they have in place makes the whole process very easy for the whole family. Everyone is so nice and friendly. My daughter was very comfortable getting her appliance and loved coming to the office to get DeSimone dollars. DeSimone Orthodontics has the most educated, courteous, and friendliest staff possible. Dr DeSimone is a perfectionist making sure you end up with a fabulous smile. She and her staff take so much time so her patients are comfortable, and the games and contests are a fun bonus. I have and will continue to recommend her office. I highly recommend Dr. DeSimone to everyone! Love this practice...they are always running on time. I have never had to wait. The staff is always so nice and answers any questions that I may have. I know my daughter is in the best of hands with Dr. DeSimone and her staff.